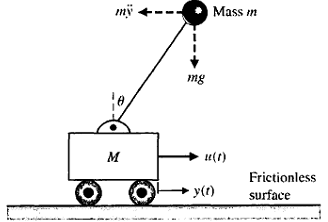 Note: the friction forces fv1 and fv2 can be thought of as damping forces. c) Draw the block diagram of the system (using the form from part b above); how many states are observable? Question: In the case of an inverted pendulum shown below, the equations of motion for control are a function of the movement in the horizontal direction and the angular motion of the bob. The angle of the bob is assumed to be sufficiently low to provide a linear model of the system. e) Is the system stable? Maturated water vapor at 800 kPa is isothermally condensed to a saturated liquid in a piston-cylinder device. Calculate the amount of heat transferred during this process.